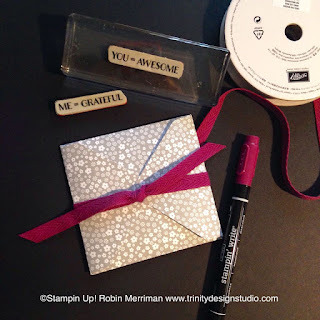 Earlier this week, I shared the Stampin' Up! Weekly Deals with you here on the blog, but did you also know that I did a short LIVE Broadcast on the new app Periscope? Yep - I sure did! And it was fun! I walked through each of the items that are on special this week and as I did so, I used a couple of the products. Well, those pieces were sitting on my stamp table mocking me (not really, but I couldn't just toss them in the trash bin!) so I decided to use them to make a quick and easy thank you note to put in a package I was sending. I used the Envelope Punch Board and a 6" x 6" piece of the Neutrals Designer Series Paper Stack (Smoky Slate) to make an envelope that holds a 3 1/2" square card. 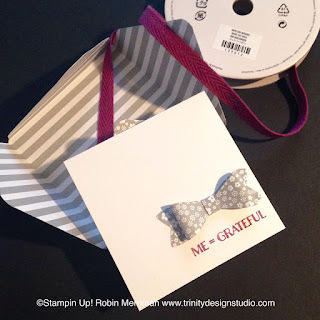 The sweet little bow was made with the Bow Builder Punch in matching paper. SO stinkin' cute! I LOVE this punch! 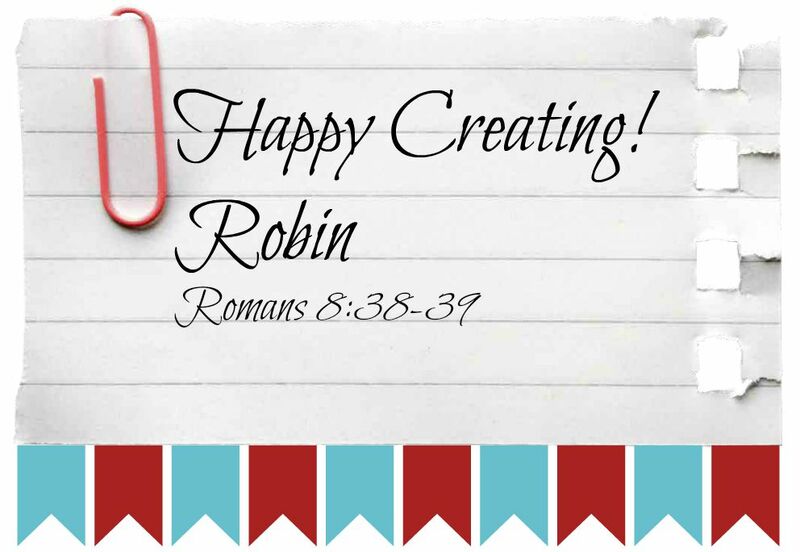 The little card was made with a piece of 3 1/2" x 7" Thick Whisper White card stock folded in half. I stamped the outside and inside greeting from the Me = Grateful stamp set in Rich Razzleberry ink. It's such a sweet little spud! it's the NEW Rich Razzleberry Ribbon from the upcoming Holiday Mini Catalog! There's 10 yards on a roll and you're going to drool when you get it delivered. It's yummy! As always, simply click on any of the products shown and you'll go directly to my Online Store to shop for the items you need and much more! 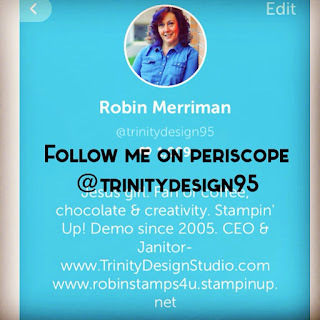 So, are you wondering what Periscope is? Wondering HOW do you find me there? Periscope is a LIVE Broadcasting app for your mobile devices (iPhone, iPad, Android) and you can download it FREE from iTunes and Google Play! Anywho, once you have the app, you can follow lots of fun people - and ME! and be notified when they begin a LIVE Broadcast. If you can't tune in right then, you have up to 24 hours to watch the replay! The fun part is that it is - or it CAN be - interactive. When you join a LIVE Broadcast, I can see you there (if I'm looking at the screen at the time) so I know who's watching and can talk to you. You can type in messages to say HI, or ask a question or give me feedback. AND if you like what you are seeing or if you want to respond to something I talk about, you can simply tap your screen and the app gives out "Hearts"! The hearts boost not only my confidence, but my rating for searches in the app - so you're helping me be discovered by NEW paper crafters all over the world! The broadcasts are live and in person - no editing at all, so what you see is what you get. And I LOVE that! I love to keep it real and I love to share the joy I get from this awesome craft, but more often than not, I don't have time to film, edit and post a 'perfect' video. And we both miss out on SO much! 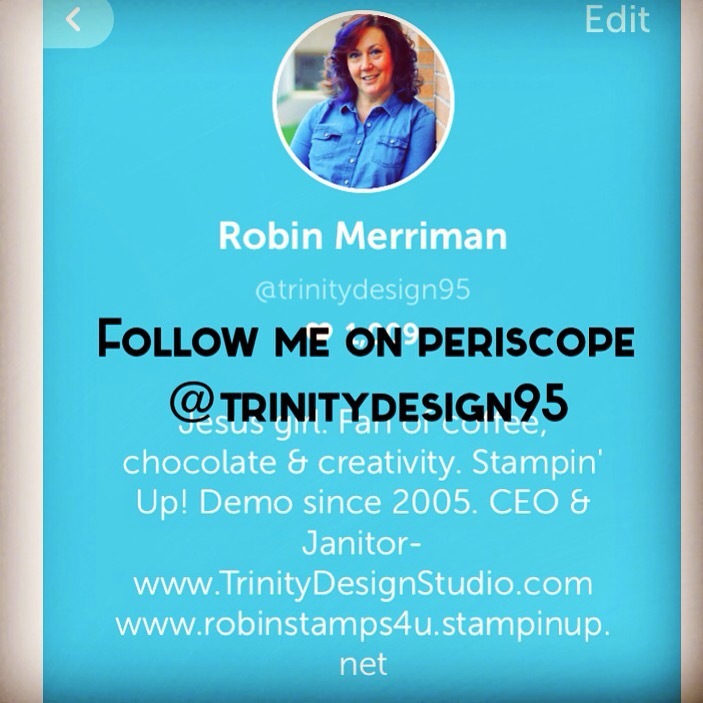 I'm planning to do lots of LIVE Broadcasts from the studio and share my passion for Stampin' Up! and paper crafting. 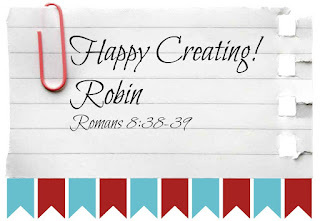 I'd love it if you joined me in the journey - and SHARE it with your friends too. Download the app and Follow me! See you back here - and on Periscope - soon!